LONDON, 2018-May-03 — /Travel PR News/ — The only direct route between Europe and Nashville launches this week (May 4) when British Airways starts flying between Heathrow and Music City. 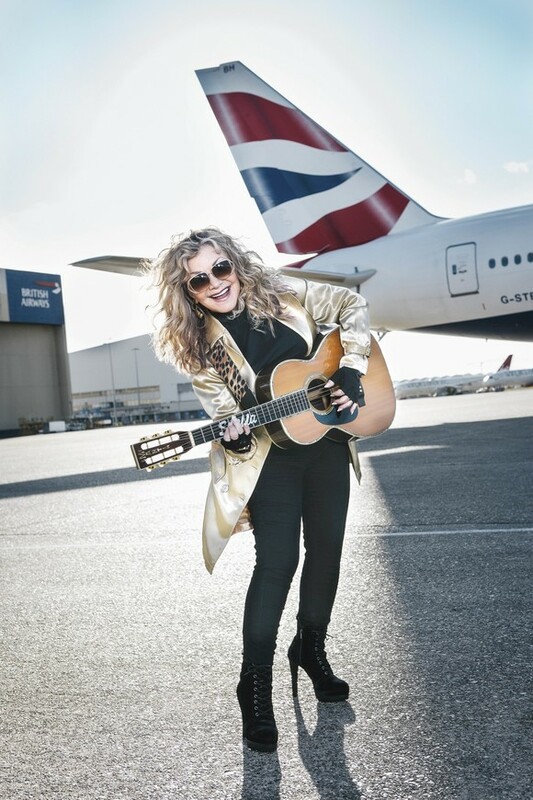 To celebrate the new five-a-week service the airline welcomed country music star, Stella Parton, to Heathrow with the Nashville native strutting her stuff and sharing her top tips. Stella, who has lived in Nashville for 50 years and whose birthday is on May 4, was photographed on board a Boeing 787-8 Dreamliner as the airline’s newest fleet will serve the capital of Tennessee. Tickets are available to buy on ba.com and start from £571 in World Traveller(economy cabin), £930 in World Traveller Plus (premium economy) and £1411 in Club World (business class). Customers can also choose to cut the cost of flights by using Avios in part payment and can pick from a range of savings. The dish marinates chicken in buttermilk, then blends cayenne pepper with other seasonings and spices to create a flavoursome fried chicken that will be served with macaroni cheese and braised kale. The new route follows the launch of New Orleans in March 2017 and Nashville will become the 26th US city the airline flies to. From this summer British Airways and American Airlines will operate up to 67 daily flights, as part of their transatlantic joint business. British Airways is investing £4.5 billion for customers over the next five years, including the installation of the best quality WiFi and power in every seat, fitting 128 long-haul aircraft with new interiors and taking delivery of 72 new aircraft. The airline is also investing £600m specifically in Club World, including outstanding catering and luxurious White Company bedding – plus, from 2019, a new seat with direct aisle access. · BA223 will depart from London Heathrow Terminal 5 at 3.45pm local time and arrive into Nashville International Airport at 6.50pm central time. BA222 will depart Nashville at 8.20pm, arriving into London at 10.30am the next day. · Nashville – British Airways Holidays offers five nights at the 3* Hyatt Place Nashville/Brentwood https://www.britishairways.com/en-gb/destinations/hotel-information/Nashville/Hyatt Place Nashville/Brentwood/US-BNA-6619477 , from £699per person, travelling November 1 to December 15. Includes World Traveller return flights from London Heathrow and accommodation with breakfast. Book by May 20. For reservations visit ba.com or call 0344 493 0122. · Nashville – British Airways offers seven days, from £599 per person, travelling November 1 to December 15. Includes World Traveller return flights from London Heathrow and an Economy car. Book by May 20. For reservations visit ba.com/car or call 0344 493 0122. This entry was posted in Airlines, Airports, Entertainment, Flights, Travel, Travel Services, Travelers and tagged British Airways, Heathrow, Nashville, Stella Parton. Bookmark the permalink.